Here is your chance to own a meticulously maintained 31 Jupiter with forward seating. It only has 400 hours on the Yamaha 225FS engines. The boat has been lightly used and operated with an open check book. The hull is sky blue with bright white topsides. All the cushions are in storage and in great shape. Don’t miss this awesome well maintained 31 Jupiter! 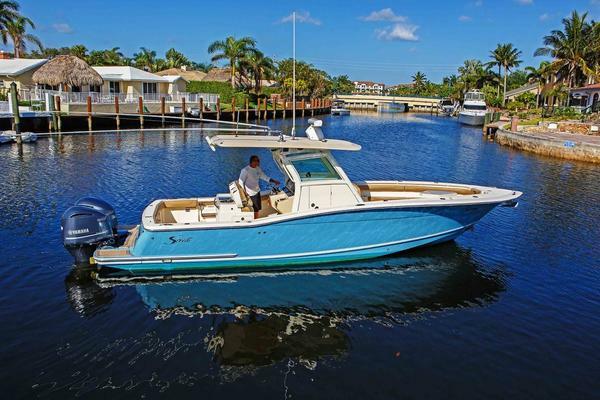 West Florida Yachts would love to guide you through a personal showing of this 31' Jupiter 31 FS 2005. This yacht for sale is located in Cape May United States and priced at $119,500. For a showing please contact us by filling out the form on this page and we will get back to you shortly! The 31 Jupiter has a large cockpit with live wells and fish boxes. A large console with a big T-Top and a stand-up head. Forward seating with storage and an anchor locker. This boat has full wrap around coaming bolsters and aft bench seat with back rest. Leaning post with rocket launcher. All the metal on this Jupiter is powder coated. Twin Yamaha 225FS with 400 hours. All services up to date with service records. Very clean boat well maintained. Turn key ready for the season. Owner has a 2003 31 Jupiter in Florida that he is interested in selling as well. Call for details.